Photo miniatures have become quite popular recently on the Internet. The following simple technique can make ordinary pictures more interesting and attractive. It is difficult to achieve the similar effect with your digital camera, because you need a special lens that costs quite a lot. Fortunately, with the few simple steps in this tutorial, you will learn how to get the perfect miniature in your photos without spending a cent. This step is one of the most important because this will not get a good results in every photo. 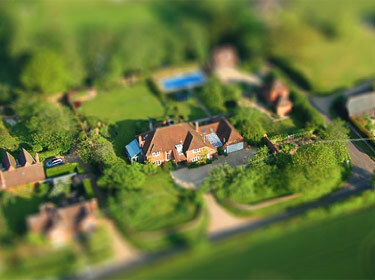 While choosing an image you should remember that miniature models should always be viewed from above. That's why you should take the photo, for example, from a roof of the house or a viewing platform that allows the camera to shoot the scene with the highest possible point. Also, try to take pictures for miniatures during daylight with good lighting. Open the Photoshop, and your photo. Next, click on the little icon at the bottom of the toolbar. You can also access this mode by pressing "Q" or in the menu Select > Edit in Quick Mask Mode. To do this, click on the appropriate icon in the toolbar, or press "G"
In the Options toolbar, make sure that the gradient goes from black to white, and select the "Reflected" type of gradient (the fourth icon from the left). Start your first line point where you want the sharpest focus to be. In other words, start to draw the line from the central object of your photo. The end point at the bottom and indicates the end of the gradual blurring. This step needs some time, and you need to experiment with line drawing to achieve the best result. I've chosen two points which are the most suitable for the current photo, but they will be different in your image. After drawing the line, some of your photo will become red. It's OK! The area where the red color is the most saturated will be the sharpest area in the final image and vice versa. Draw your focus line again if you aren't happy with current result. To continue, press "Q" again or click the icon at the bottom of the toolbar. After you exit from Quick Mask mode, two areas will be highlighted. To add depth to your image, select Lens Blur filter from the menu Filter > Blur > Lens Blur. Now we start to experiment with a radius of our Lens Blur. There is no predefined value, and we should select it approximately. Too small a value for the radius will cause miniature effect simply not to occur. Too big a value and the image will lose realism. For this picture, best of all suits value 25, but yours may be different. Click "OK" when you are satisfied with the result. Our effect is almost ready. Deselect with Ctrl + D or choose from the menu Select > Deselect. In order to give our image a "plastic toy" feeling, we slightly increase the saturation. To do this, open the Hue/Saturation with Ctrl + U or in the menu Image > Adjustments > Hue/Saturation. In the Hue/Saturation panel, pull the Saturation slider to the right to increase the saturation. Do not overdo it, but change it enough to give the photos a "toy" form. This technique will help you get good results with photos of landscapes, city streets, crowds of people and many others. This is a great way to surprise and amuse your friends and family. Experiment and achieve good results! I hope you learned something new today. Do not forget to share links to your miniatures in the comments below!